51 spacious rooms and 51 luxury suites. 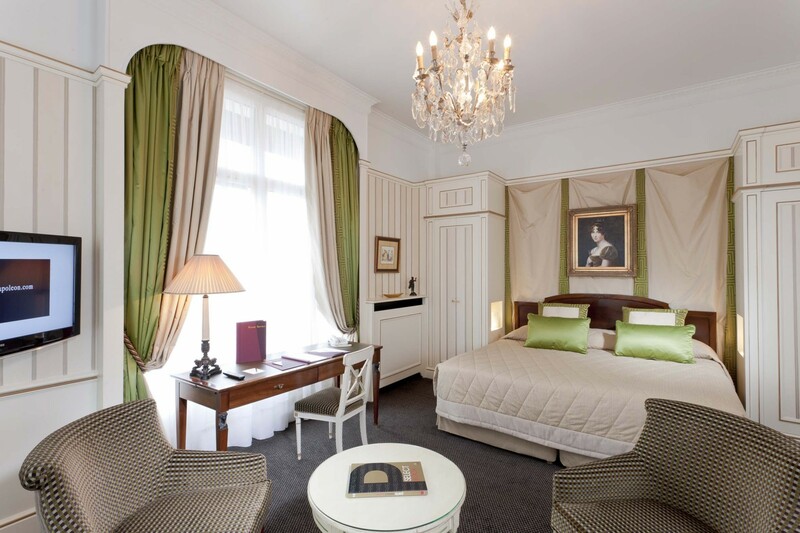 51 rooms and 51 spacious and quiet suites in an elegant Empire style with some very Parisian modern touches. Some overlook a courtyard of flowers, others the famous Avenue de Friedland. 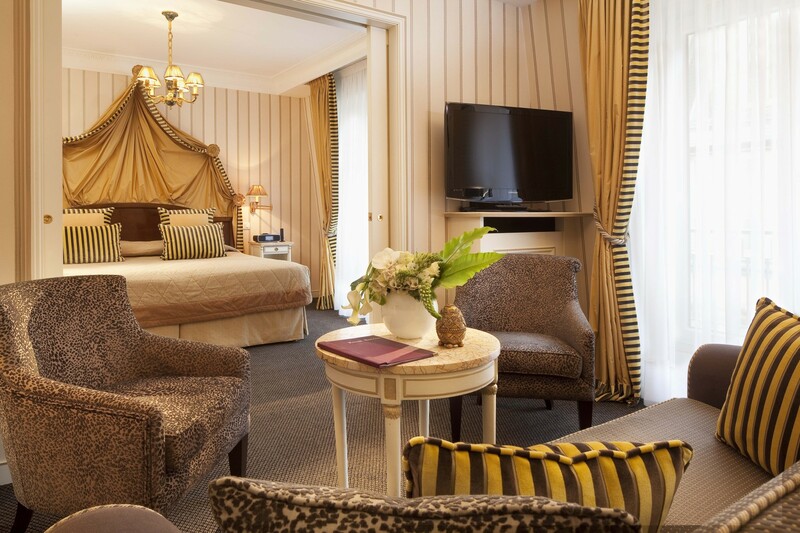 And for an extra special occasion, choose a suite with terrace overlooking the Arc de Triomphe or the Eiffel Tower. 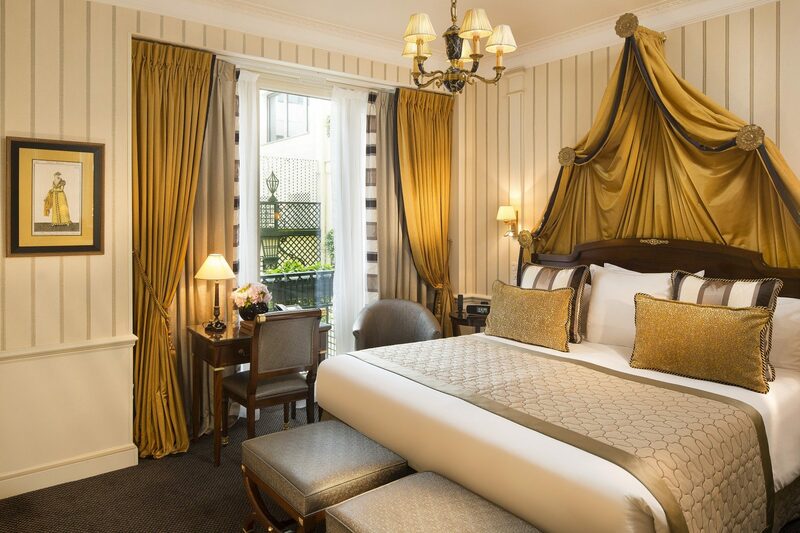 Cosy atmosphere, warm tones, our classic rooms are deliciously romantic. Pretty collection fabrics and antique paintings perfectly express French chic. Overlooking the Avenue de Friedland or one of our flowery courtyards, all guarantee calm and relaxation. The rooms are decorated in the "Empire" style and the marble and mahogany bathrooms have bathtub with shower and L'Occitane en Provence welcome products. 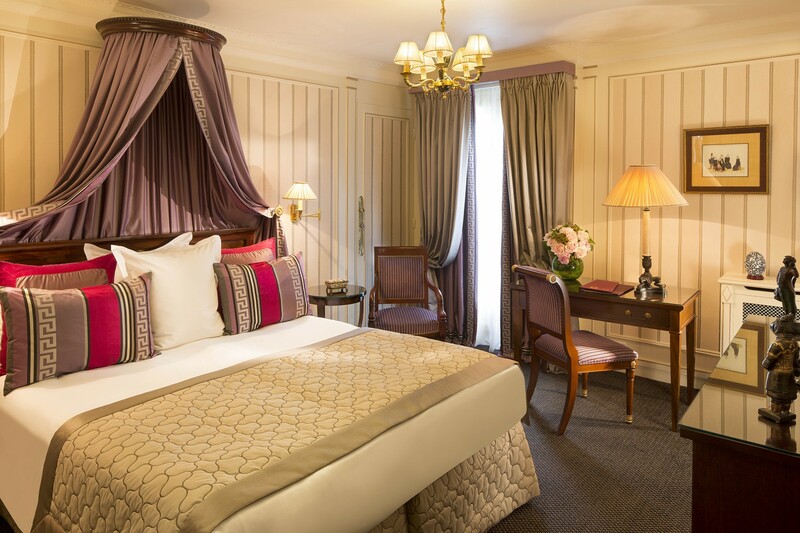 With hues of soft colours and "Empire" style grand drapery, our superior rooms have a typically Parisian charm. They look out over either one of our flowery courtyards or onto the beautiful Avenue de Friedland. Their relaxing atmosphere inspires tranquility and rest. These elegant rooms are all equipped with a desk for working, writing or simply dreaming. The beautiful marble bathrooms with shower and/or bath come with L'Occitane en Provence products. 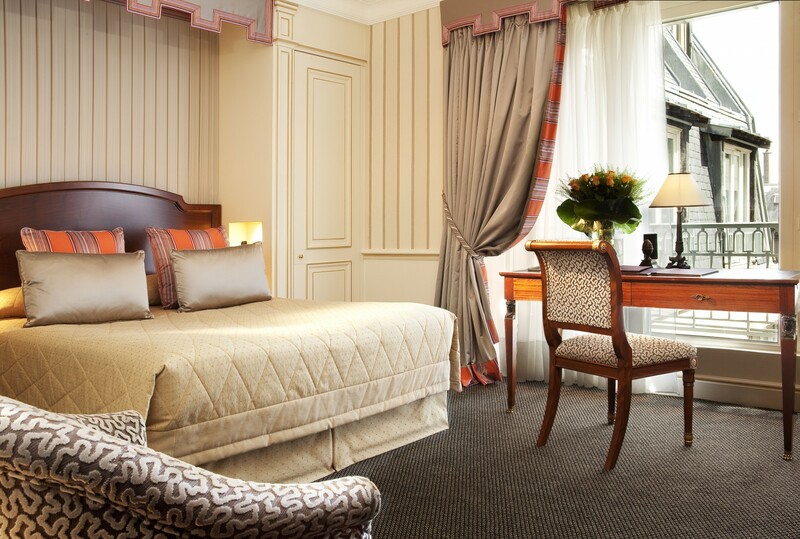 Classic elegance and mahogany furniture, our executive rooms are the perfect expression of the Napoleon Hotel. Their comfortable armchairs and shimmering fabrics will give you the sensation of a large, inviting house. These very spacious rooms overlook either one of our flowery courtyards or the Avenue de Friedland, one of the famous avenues of the Place de l'Etoile. The beautiful marble and varnished wood bathrooms with shower and/or bathtub come with L'Occitane en Provence products. What could be more refined than a richly decorated junior suite in the heart of the elegant 8th district? 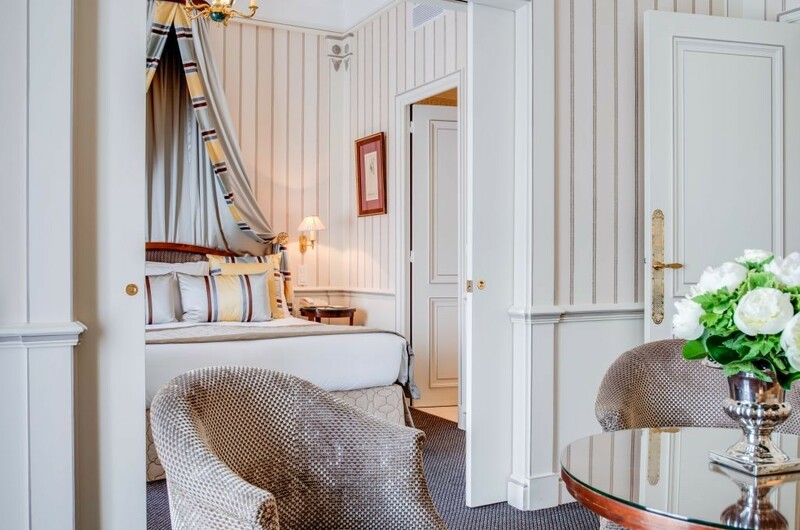 With their Empire woodwork and deep velvet, our junior suites are the ultimate expression of Parisian chic. Overlooking one of our flowery courtyards, they give a gentle impression of space, light and tranquillity. The living room area offers a comfortable sofa that can be converted into an additional bed for two people. Ideal for families. The beautiful marble and varnished wood bathrooms with large shower and separate bath are supplied with L'Occitane en Provence products. It is a great feeling to be in a very unique place. 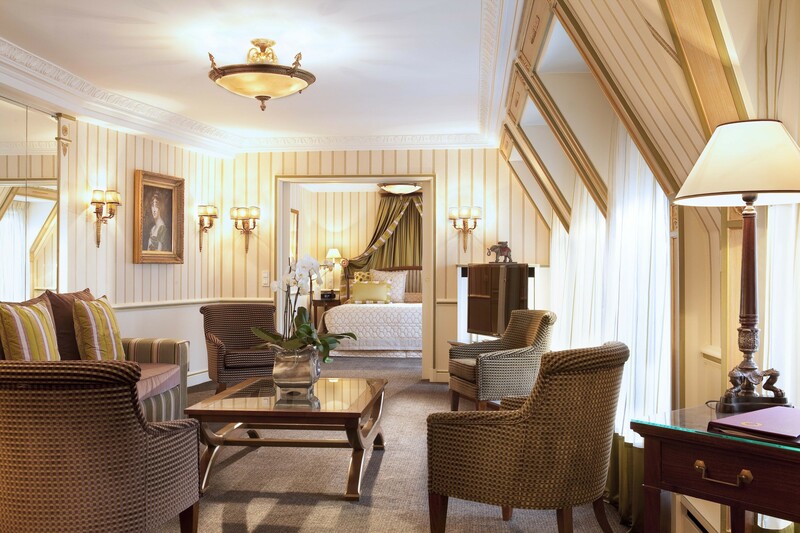 With our "Avenue" junior suites you will have a front row view of Paris. 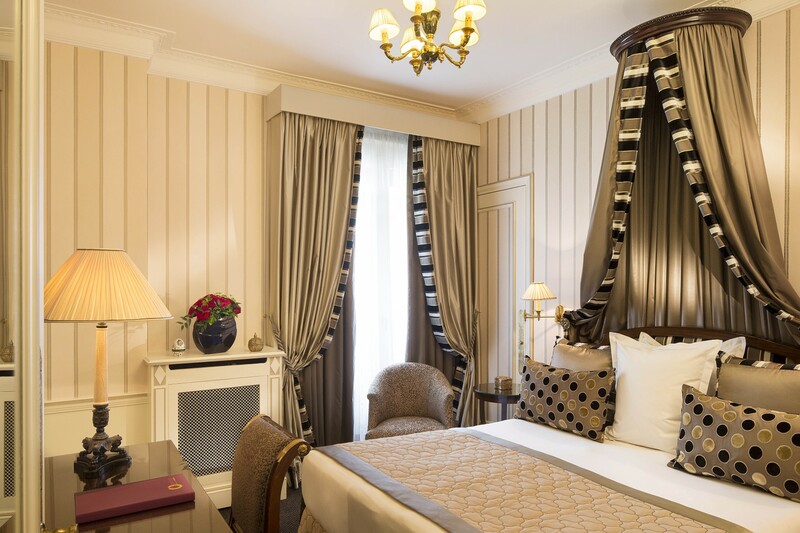 Facing south, overlooking the famous Avenue de Friedland, our junior suites are spacious and bright. 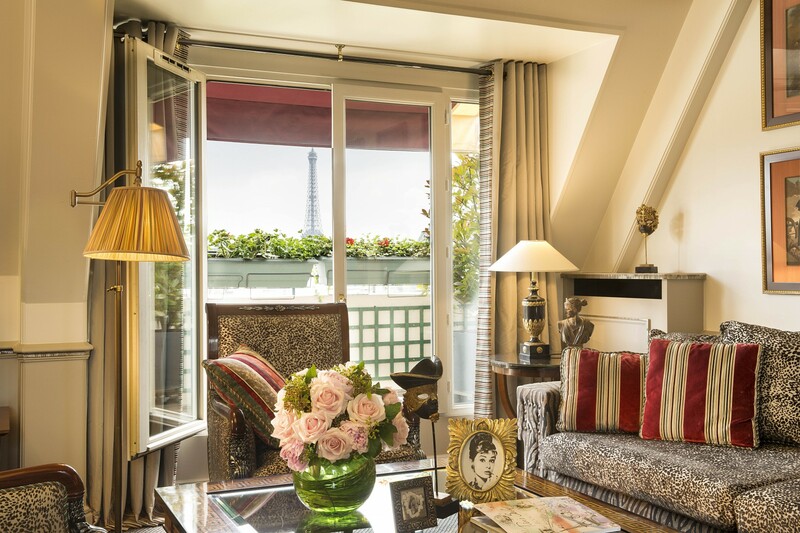 Some rooms have a private terrace or balcony with views of the Arc de Triomphe or the Eiffel Tower. Elegantly decorated in "Empire" style, they include a seating area with sofa. This can be converted into an extra bed for two people. Ideal for families. The beautiful marble and varnished wood bathrooms with large shower and separate bath are supplied with L'Occitane products. 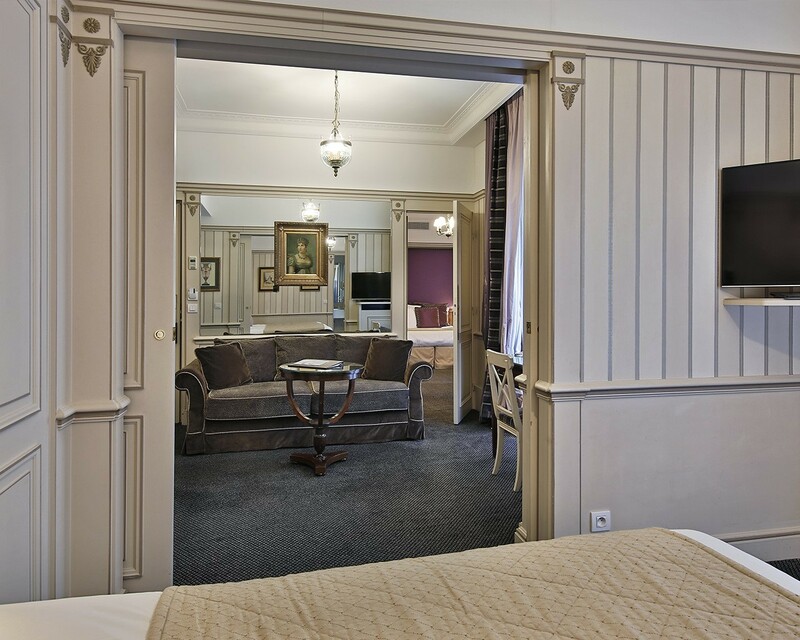 The Napoleon Hotel's Suites offer you something precious: calm and comfort in the heart of Paris. Deep armchairs, antique paintings, embroidered fabrics, every detail expresses peace and luxury in the French manner. The majestic canopy crowning your bed harks back to the "First Empire", providing the inspiration for the entire decor, artfully combined with the latest technologies. Overlooking a flowery patio, they feature a living room with a desk and sofa. The sofa can be converted into an extra bed for two people, ideal for families. The magnificent marble and mahogany bathrooms with large shower and separate bath come with L'Occitane products. View of the famous Avenue de Friedland or the Arc de Triomphe, our "Avenue" suites will provide you that intense Paris experience. The many reminders of Napoleon and the Empire set the tone for the decor: noble and elegant. Facing south, with balcony or terrace, our "Avenue" suites are bright and comfortable. The bedroom is equipped with a dressing room, the independent living room is warmly furnished with two armchairs and a large sofa. This can be converted into an extra bed for two people. Ideal for families. The magnificent marble and mahogany bathrooms with large shower and separate bath come with L'Occitane en Provence products. Our connecting rooms near Champs-Elysées provide a pleasure that's rare in Paris hotels: space! These rooms are like small apartments, with lounge corner, two fine marble and mahogany bathrooms and look out either to a flower-decked patio or the splendid Avenue de Friedland. Our communicating rooms consist of a suite or a junior suite with one large bed and one sofa-bed and a spacious room with one large bed or two separate beds. Ideal for families, they can accommodate three to six people. Discover our suites. This spacious and intimate suite of 80 m² is named in honour of Josephine Baker. Located on the 6th floor, its many windows and its harmony of pastel shades make it a very bright apartment. Overlooking a quiet and discreet interior patio, it consists of a two-room apartment including a bedroom with a king-size crown bed and a large independent living room with armchairs and sofa bed. This can be converted into an extra bed for families. The two bathrooms, all in marble and mahogany, are equipped with a bathtub, a separate shower and L'Occitane en Provence products. 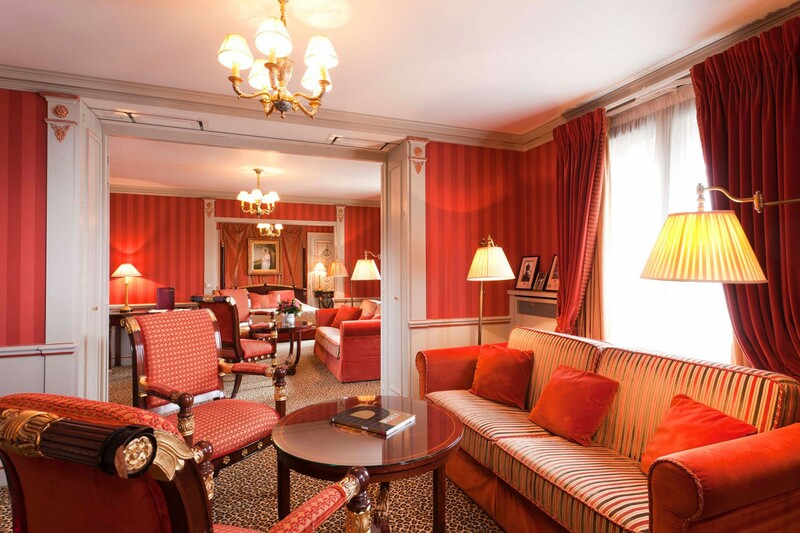 This suite is evocative of a magnificent St. Petersburg palace to which the hotel pays homage. Its plush and comfortable decor subtly brings back the grandiose Russian spirit of the time of the tsars. The warm red tones of the tapestries and velvets are both bright and welcoming. Located on the 6th floor and comprising two apartments that come together in a large suite by a system of sliding walls, it has two lounges and two spacious bedrooms. Each has its own bathroom equipped with a bath, a separate shower and L'Occitane en Provence products. Ideal for family stays. 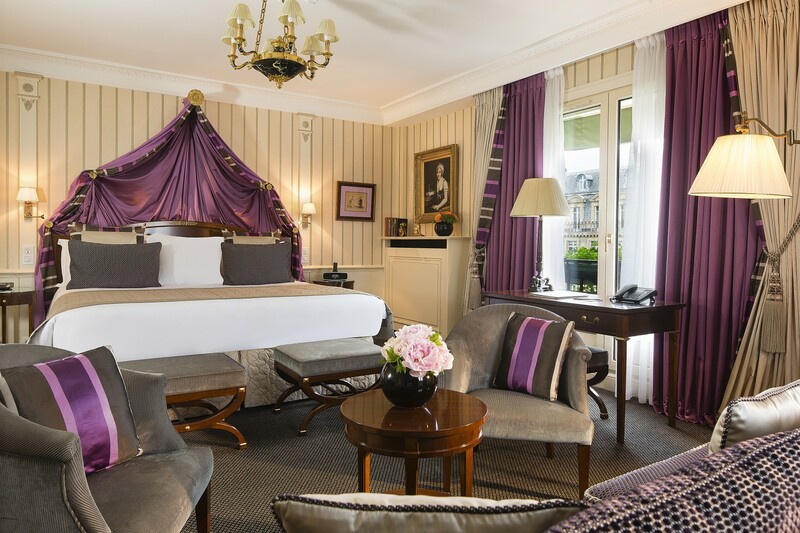 The Imperial Suite maintains the image of the Champs-Elysees district: prestigious. Its exceptional location on the 7th floor gives it a unique view of the Paris rooftops and two of its most iconic monuments, the Eiffel Tower and the Arc de Triomphe. This private apartment consists of a living room of 40 m² and two bedrooms to which can be added a Junior Suite. The decor subtly combines contemporary and stylish furniture, and the fabrics are designed by great masters. On sunny days, the panoramic terrace entices you to intimate breakfasts or romantic dinners. Each of the spacious, sunny rooms has its own complete mahogany and marble bathroom, equipped with a bathtub and a separate shower.